Radda explained that the process would enable informal enterprises metamorphose into formal sector, industrialize the nation, develop the rural economy, stem youth restiveness and unemployment as well as create sustainable economic growth and development. He disclosed that Women Cooperative Societies were selected in Goronyo, Shagari and Ilela local government areas, which included processors of groundnut, rice and cassava products. 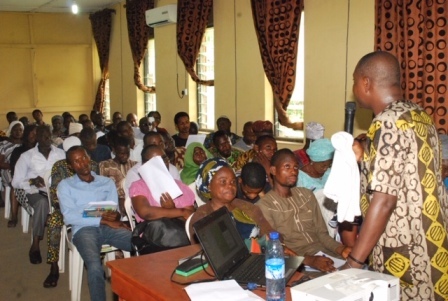 According to him, transparent strategies were adopted in the selection of beneficiaries, adding that the criteria included that they own existing or initiate a new business, registered or would be registered among all categories of trades with proper identifications. 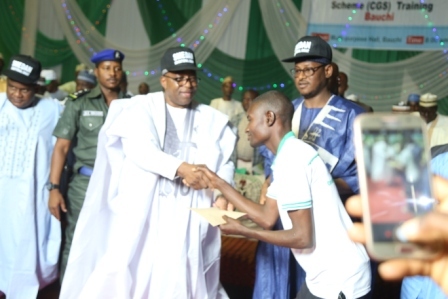 The SMEDAN Director General also expressed the Federal Government’s commitment to implement its ‘One Local Government One Product’ (OLOP) initiative in each of the 109 Senatorial District in the country to boost the MSMEs in Nigeria. The Minister of State for Commerce, Trade and Investment, Hajiya Aisha Abubakar, underscored the justification for a special entrepreneurship/vocational development intervention for entrepreneurs at the bottom of the pyramid based on the need to industrialize the nation, develop the rural economy, stem youth restiveness, unemployment and create the platform for sustainable growth and development in Nigeria. 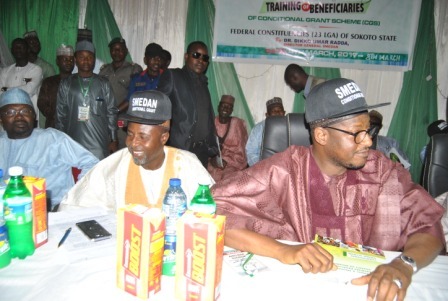 In his remarks, the Chairman, Northern Senators Forum, Senator Aliyu Magatakarda Wamakko lauded the federal government initiative he particularly commended SMEDAN for its role in developing MSMEs in Nigeria, “I have watched with keen interest the role the Management of SMEDAN are playing in this sector”. Senator Wamakko noted that the CGS scheme was a game changer adding it is indeed a catalyst for economic development especially at the grassroots.